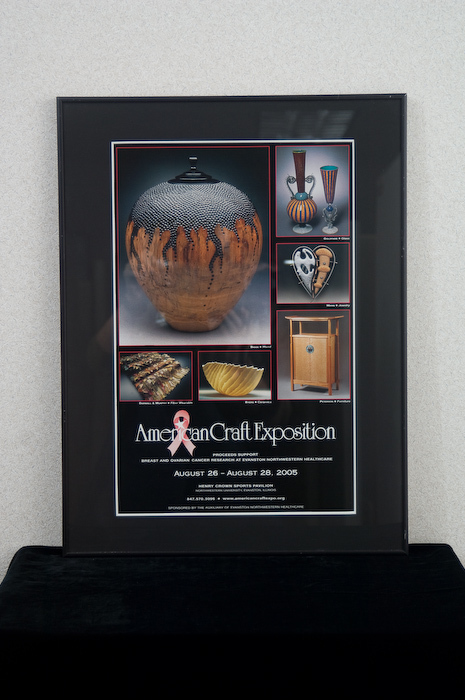 The American Craft Exposition (ACE) has had a rich history since its inception in 1985. Each year ACE presents something new to constantly better the show and to best keep the show’s prestige. In 1986, ACE had its best attendance at 4,000 people and saw profits of $8,200, a substantial amount for such a young craft show. The show saw a move to a new venue, the Henry Crown Sports Pavilion, and saw an addition of 125 exhibitors while becoming a juried show. “The Best Of” award was established in this year. Attendance continued to rise reaching 11,700 attendees. It’s in these years that lectures by ACE craftsmen were initiated, a tradition still upheld today. A craftsman’s award was added with support of area galleries. Designated categories of giving were established in 1994, along with booth lectures, proving to be so popular that it’s continued every year. 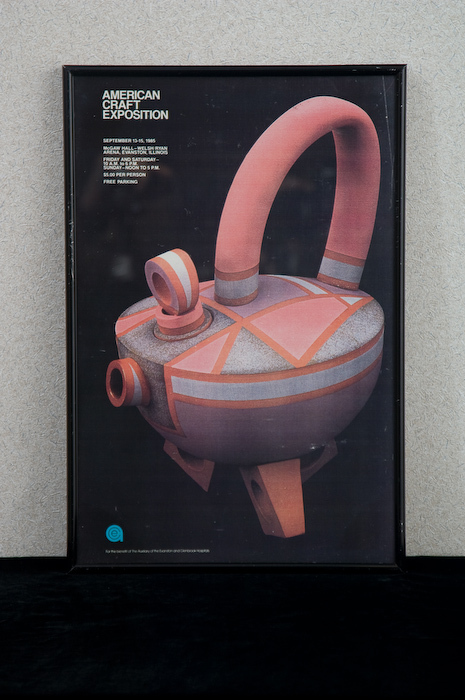 ACE was named one of the top three craft shows in the country in 1995 and booth lectures were filled to capacity. The following year saw the largest committee of volunteers and the Patron Hour was renamed the Collectors Hour. Michael Monroe of Peter Joseph Gallery in NYC, who was a former curator of the Smithsonian’s Renwick Gallery, was the curator of the White House Collections of American Crafts and served as a judge and lecturer. 1998 was a fantastic year for ACE. The furniture category was added and preview party tickets were mailed which eliminated lines. The purchase award was increased to $4,000 and the Benefit Preview Party saw a record attendance of 1,374 patrons. That same year held record overall attendance of 13,500. 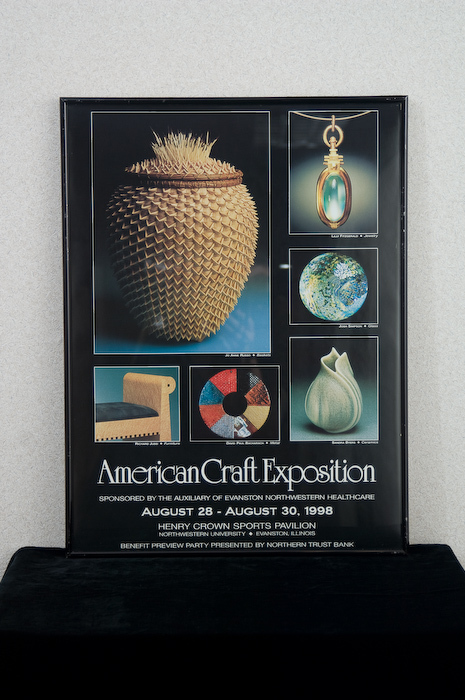 1999 saw a new award honoring Best of First Time Exhibitors to ACE and $2.8 million in artisan sales and continued to rise in following years. 2000 saw a radical change in the way that ACE fundraised. The Auxiliary of NorthShore University HealthSystem (NorthShore) at Evanston and Glenbrook Hospitals voted for five years of ACE proceeds to benefit and fund breast cancer research. Additionally, the Collector’s Hour saw a record attendance of 300 while ACE was voted the No. 1 indoor show by the National Association of Independent Artists. ACE raised a record of $265,000 for breast cancer research and awards to artists totaled $12,000 with the purchase award increasing to $6,000 to include Highland Park Hospital in 2001. A donated memorial quilt was hand-stitched by breast cancer patients and friends and purchased for $5,000 to be displayed at Kellogg Cancer Centers. This year saw 140 artists with 31 new to ACE and the Illinois Artisans Program had a booth display in the lobby, giving artists an opportunity to display large objects in the lobby. Individual and corporate sponsorship gifts continued to support breast cancer research in 2002. This same year a fieldtrip was arranged to two Wisconsin Art Museums — Wustum and Milwaukee Art Museum with the curators speaking at ACE. Barbara Rinella held a book review breakfast, featuring upbeat cancer survivor stories. ACE won a Peoples’ Choice Award, sponsored by the Chicago Tribune. ACE saw another amazing year in 2003 as the show committed to fundraising for breast and ovarian cancer research and established a goal for a $1,000,000 endowment. The Auxiliary sponsored the White House Collection of American Craft at the Block Museum of Art to raise awareness of ACE while 12 ACE artists were featured. Additionally, a Chihuly glass piece was auctioned for $13,500 and six weeks of lectures at Northwestern University were presented as part of adult education. ACE artists Karen Krieger and Claudia Reese created art pieces specifically to raise funds for breast and ovarian cancer research and five ceramists gave demonstrations on the potter’s wheel during the show. “Craft for a Cure” replaced the silent auction, in which artists could designate a percentage of sales from a piece to the funding goal and 98 artists participated. A new “Emerging Artists’ Category” was created giving first-time applicants a chance to be juried in the show and share a booth in 2004. To heighten city awareness of ACE, a partnership evening event in the “Furniture District” with refreshments and a trolley between 16 furniture boutiques in the Furniture District. In 2005, an interactive demonstration stage in the center of the pavilion was a new feature furnished by Sawbridge Studios. A home display vignette was accessorized with items provided by the artist’s at the show and two fashion shows, a ceramic potter’s wheel and wood turning demonstrations ran throughout the weekend. ACE hosted the opening of “Sculpture in Glass” at the Block Museum. The next year saw streamlined award judging by changing to Awards of Excellence and Honorable Mentions. Additionally, increased patron awareness of cancer research with presentations and Q and A by hospital research scientists continued throughout the show, allowing patron participation. The Joan Kowing McGregor Memorial Award was established in 2007 and the artist mixer moved to Thursday and popular demand exceeded lunch supplies. The Coffee and Conversation Saturday morning event with physicians and WGN’s Dean Richards drew positive community feedback and attendance. The following year marked the completion of the $2 million endowment for breast and ovarian cancer research and Robin Roberts, ABC Good Morning America, spoke at a special event about surviving cancer. Kat Szymanski, Project Runway semi-finalist, emceed a Friday night fashion show. 2009 was a celebratory year recognizing ACE’s 25th Anniversary and as such, a program/tea at Fortnightly Club promoted ACE featuring the ACE founders. Additionally, celebratory lunch for past ACE chairs was hosted by Mr. Mark Neaman, President and CEO of NorthShore. A Sunday morning seminar for exhibitors discussed the effects of the recession on their livelihood and Skokie Hospital joined as a Purchase Award donor. Funds were awarded to Dr. Selker at the NorthShore Research Institute for a Clinical Research Coordinator for breast and ovarian cancer research in 2010. Additionally, a WTTW Saturday morning event at the Gene Siskel Theater in Chicago highlighted the Craft in America series on PBS, while the Saturday morning artist event with Dr. Katherine Yao highlighted breast cancer research. In 2011, additional support was raised for Dr. Gus Rodriguez’s research project for ovarian cancer risk assessment and prevention. The show was expanded by adding two additional booths with the option of adding two more booths in 2012. In 2012, $190,000 was raised for Dr. Gus Rodriguez’s research project for ovarian cancer risk assessment and prevention and two larger booths were combined which expanded the booth count to 154 plus 10 emerging artists. Wi-Fi, new floor covering and a large permanent sign for the corner of Sheridan and Lincoln were new investments for the show. Finally, ACE was featured on “Around Town” with Ana Belaval of WGN morning news. ACE has changed a lot over the years, from deciding to fundraise for cancer research to increasing booth space, and the show has only gotten better thanks to the dedicated committee members and wonderful patrons like you! Here’s to many more great years of ACE! I recently had the pleasure of interviewing this year’s American Craft Exposition Co-Chairs, Dana Turban and Leslie Sevcik. Read the interview below! 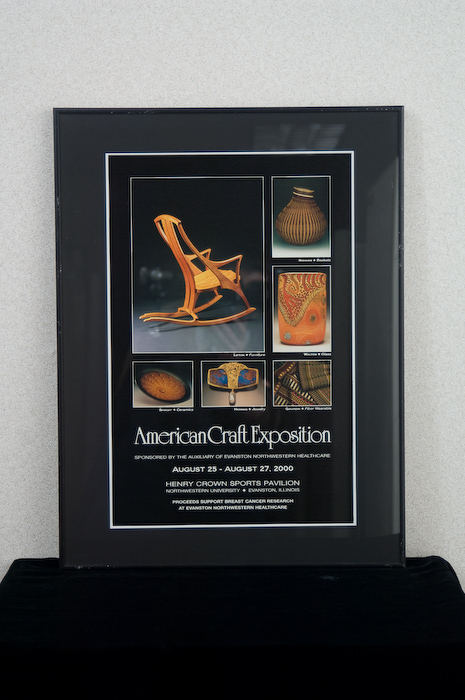 Question: What first drew you to the American Craft Exposition (ACE)? Dana Turban: I had been involved with The Auxiliary of NorthShore University HealthSystem at Evanston and Glenbrook Hospitals (The Auxiliary) for awhile in various capacities. I was approached by Sandy Miller to see if I would be interested in chairing the show with her. I didn’t know anything about craft but did know a lot about doing a fundraiser for The Auxiliary. Sandy and I were asked to do it—she handled the artist side of the show and I did The Auxiliary side. I fell in love with the show and the more I learned about the artists and their craft, the more I loved working with them and learning from them. Leslie Sevcik: The year I joined The Auxiliary, my friend Helen Coleman was the ACE Chair with her friend, Joan Kowing McGregor. I joined the committee to help my friend and I have worked on it ever since. I think this is my 14th show. Q: What’s your favorite art medium at ACE and why? Do you feel that your love of art has grown since being part of ACE? Dana: That is hard to answer. Of course I love the beautiful jewelry but have really developed a love for “vessels.” While I started out just liking glass, I have really fallen in love with the vessels created by the ceramicists and the woodturners. I try to get a piece from one of these mediums each year. Leslie: I know it will sound like a cop out, but my favorite medium at ACE is the artists themselves. Once you get to know the maker and learn about the process, you fall in love with the end product because of that connection. I began naturally drawn to jewelry and ceramics but have since learned about all the other media and learn something new every year. It will be even more of a learning year for me this year as Co-Chair, because in my former role as Staging Manager, I didn’t have as much time to look at the art since I was always troubleshooting the show. Q: What is your favorite ACE moment? Maybe it was meeting a new artist, or a specific special event. Why does that memory stick out to you? Dana: The second time I chaired the show with Sandy Miller, Sandy had come up with the idea of our Emerging Artist Gallery. We devoted a good amount of time to developing this idea and when our structure went up and was filled with that year’s emerging artists, it was really a moment of pride for me. The Emerging Artist Gallery was a huge success for the show and has continued on since. Leslie: I probably have a favorite moment from every show but most of them have to do with the people involved. We have wonderful volunteers, without whom the show could not happen, and fantastic corporate sponsors along with the doctors we are funding. It is also great to witness interactions between artists at the top of their game and customers who truly love their products. My very favorite moments have been the acts of kindnesses done for me while working long hours in the staging area—from Northwestern University security guards escorting me to my car to the gals in the Treasurer’s Office letting me hide for a moment or two! Q: What are you most looking forward to for ACE 2013? Dana: I always look forward to that moment at the show when the judging for the awards takes place—it is a quiet time on the floor and I can walk around by myself and view all of the beautiful work in a very peaceful way. It is really quite an experience to view all of the exquisite art with no one else around besides the two judges. I then am always in awe that my committee of dedicated volunteers made this possible and that each year’s show is more beautiful than the one before. Leslie: I am looking forward to ACE 2013 because it has been a tough year for many of our artists and I know they are going to have a great show with us to cap off their year. We have been working very hard on our marketing this year and have a few surprises up our sleeve! Q: ACE isn’t just an art show; both The Auxiliary of NorthShore University HealthSystem at Evanston and Glenbrook Hospitals and the entire ACE committee play a role in battling ovarian cancer by supporting essential research. Why do you, personally, feel that it’s important for ACE to help cancer research? Dana: We struggled for awhile for our patrons to realize that we were raising money for projects at NorthShore University HealthSystem (NorthShore). So, one of our ACE chairs, and passionate supporter, Joan Kowing McGregor, decided that we needed to raise money for a number of years for one cause and we chose breast cancer because we are a committee of over 300 women. We turned each year’s proceeds over and were able to fund numerous breast cancer projects and set up a $2 million endowment that assured that these projects would be funded each year by researchers at NorthShore until a cure is found. We then decided to take on ovarian cancer—a diagnosis that every woman dreads receiving. We have all enjoyed raising money for Gus Rodriguez, MD, who is passionate about his work and mission. Dr. Rodriguez has had more meaning to us because some of our Auxiliary board members are battling ovarian cancer. For me personally, I want to be able to fundraise as much as I can to help with women’s cancer research so that one day my daughters will benefit from the advances that were made because of The Auxiliary’s commitment to finding cures. Leslie: One of the great things about ACE is that it achieves multiple charitable goals all at once. All of us who work on the show year after year truly want fine craft in America to flourish, as well as the wonderful artisans who are helping that to happen all over the country. The fact that we can do that while simultaneously supporting a wonderful doctor, Dr. Rodriguez, whose research and clinical work is about saving the lives of women, is a wonderful added incentive. The representation of NorthShore’s research work to the public, the goal of helping The Auxiliary to fund his work and the mission to support craft in America are all linked together through ACE. You can’t separate one of those goals from the other; they all intertwined. The fact that some of our artists and some of our volunteers have been touched by cancer in some way makes this even more poignant. We have three Auxiliary Board members fighting ovarian cancer right now and we all know it could be any one of us in the future. Anyone who has met Dr. Rodriguez knows he is literally devoting his life to battling cancer, every day. He is the most wonderful protector of women and I know he is the one to invest in when it comes to funding research. I really believe in his work and in him. I know his patients feel the same way because they come up to us and tell us at the Show.